Welcome to the Detroit! We are excited to host a Campus of Universidad Sin Fronteras. This is movement building time in Detroit. Thousands of Detroiters are struggling over how to revitalize our city and whose vision will determine how Detroit is designed and developed. We struggle to balance intergenerational space, practical application to local forces in motion, and decolonizing our past, present, and future. The UNSIF campus in Detroit has presented at the Detroit Water Forum at the African World Festival and at the North End Urban Arts Expression Arts Festival. Throughout these seminars, they were committed to building partnerships for political education, media analysis, entertainment justice, and community building. 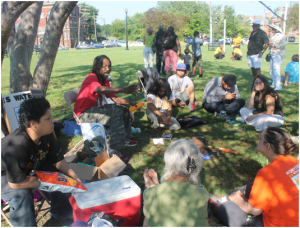 They share ways in which the fight for water is the People’s Struggle to free themselves and engage conversations around decolonization and liberation to create plans for a better Detroit. is the campus coordinator and is happy to plug you in or answer any questions. East Michigan Environmental Action Council is the local Anchor Organization, bringing extensive experience in environmental justice advocacy and youth leadership development. Clearly there are multiple issues we are grappling with in Detroit. And at EMEAC we’ve had our hands in many as we continue work to empower the Detroit community to value the air, land and water ecology. Our food system is directly nested in our environmental/ecological systems & worldwide energy footprint and in the JUST TRANSITION campaign we are calling for a transition from our extreme energy economy to a JUSTICE centered, localized, resilient economy. Policy has a significant role to play in this shift towards resilience and must be leveraged to build transformative solutions, alongside grassroots organizing. In Detroit, we are grappling with multiple issues simultaneously (e.g., incinerator, highway expansion, trolley, increased pollution, water shutoffs, limited access to healthy foods, etc. ), all of which are rooted in a socioeconomic, political system that perpetuates and benefits from race, class, and gender inequalities and oppressions. We are building with others locally and regionally to oppose this system, while generating solutions that involve creating local living economies that foster community resilience. The main strategy that we will employed to build community resilience is through political education tactics using the Universidad Sin Fronteras platform. Universidad Sin Fronteras (University without Borders) and the Cass Corridor Commons University: The Commons University (CCCU) is a collaborative between community, partners, Wayne State, University of Michigan and MSU comprised ofcommunity-based learning enriched course work that encouraging students to apply the knowledge and skills learned in the classroom to the pressing issues that affect our local communities. Working with faculty members and community leaders, students develop research projects, collect and analyze data, and share their results and conclusions, not just with their professors, but also with organizations and agencies that can make use of the information. Students can do such community-based work both in courses and, in a more in-depth manner, as part of junior or senior independent work. The courses below and many others have a community-based component and/or offer an opportunity to do a community-based work project in partnership with local organizations. CCCU course work will focus on food justice. The opportunity for building this as a political education tool is in building EMEAC base and working towards one of our E4H goals of increasing membership in numbers and quality of experience. In order to provide political and popular education and skills development training, Southwest Workers Union established an in-house organizing leadership justice institute early in 2003. This educational work and leadership development has evolved and grown into the University Sin Fronteras founded in 2010. EMEAC is the Detroit site and anchor for UNSIF. UNSIF course will include food justice, discussion and round tables educating community members and University students on food related policy and practices.